Born in 1988, Rihanna has won numerous beauty pageants as a teen, and became used to attention and public appearances. When one of her friends introduced her to Evan Rodgers her life was changed from local schoolgirl to internatinal pop sensation. See the Thianna guitar tabs and chords here. He was a producer from New York who was in Barbados on a vacation with his native wife. Rodgers sent her to New York to meet Jay-Z, CEO of Def Jam Records and himself and international music star. He heard her sing and was overwhelmed. He knew she was destined for success! 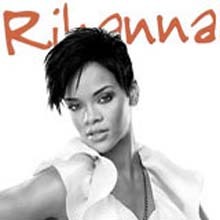 She was only 16 when she was signed and release her first single which you will find the Rihanna tabs to at these pages.